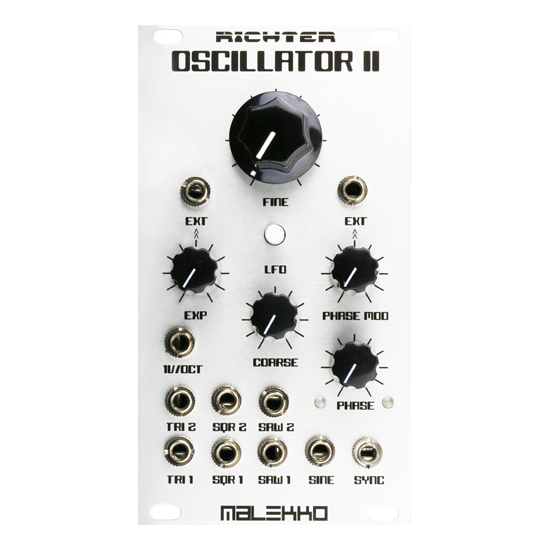 The Malekko/Richter Oscillator II is a great-sounding, solid analog Oscillator/LFO with some serious tricks up its sleeve.Fine and Coarse frequency controls are provided. Volt per octave and exponential (with attenuator) CV frequency inputs are provided. An output for each waveform is provided (Sine/Triangle/Square/Saw). A second series of outputs are provided for phase-modulated versions of the Triangle, Square, and Saw waveforms. Read more below!